Great way to display signs in high traffic areas. Sign stand allows to display single or double posters. Color: chrome. Great way to display signs in high traffic areas. Sign stand allows to display single or double posters. Colors: chrome; black. Attract customers to your store by displaying signs in high traffic areas. Sign stand allows to display single or double posters. Color: chrome. Attract customers to your store by displaying signs in high traffic areas. 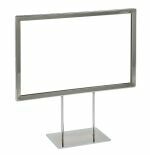 Sign stand allows to display single or double sided posters. Colors: chrome; black. 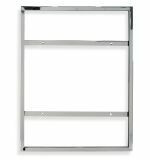 Attractive two-tier poster holder will help you display signs in high traffic areas. Colors: chrome; black. Three-level sign holder will help you display signs in high traffic areas, made of square tubing frame. Weight: 25 lbs. Colors: chrome, black. Attractive three-tier sign holder will help you display signs in high traffic areas. Weight: 24.5 lbs. Color: black. Attractive three-tier sign holder will help you display signs in high traffic areas. Weight: 24.5 lbs. Color: chrome. This literature holder easily fits all sign holders. 10"W x 18"L x 6"D. Promote your flyers, special offers or catalogs with this simple attachment. Color: chrome, black. Counter top card frame stand. Top loading insert slot, freestanding. Frame Size: 5 ½ High X 7" Wide Color: acrylic, chrome. Counter top card frame stand. Top loading insert slot, freestanding. Frame Size: 7"High X 11" Wide Color: acrylic, chrome. Counter top card frame stand. Top loading insert slot, freestanding. Frame Size: 5 ½ High X 7" Wide Color: chrome. Counter top card frame stand. Top loading insert slot, freestanding. Frame Size: 7"High X 11" Wide Color: chrome. Counter top card frame stand. Top loading insert slot, freestanding. Frame Size: 11"High X 14" Wide Color: chrome. Counter top card frame stand, base 11"W x 5" deep. Top loading insert slot, freestanding. Frame Size: 14"High X 11" Wide Color: chrome. Counter top card frame with adjustable stand from 20"H to 29"H. Top loading insert slot, freestanding. Frame Size: 11 High X 8½" Wide Color: acrylic, chrome. Counter top card frame with adjustable stand from 23"H to 35"H. Top loading insert slot, freestanding. Frame Size: 11 High X 8½" Wide Color: acrylic, chrome. Counter top card frame with adjustable stand from 26"H to 41"H. Top loading insert slot, freestanding. Frame Size: 11 High X 8½" Wide Color: acrylic, chrome. Counter top card frame with adjustable stand from 29"H to 47"H. Top loading insert slot, freestanding. Frame Size: 11 High X 8½" Wide Color: acrylic, chrome. Counter top card frame with adjustable stand from 14.5"H to 23.5"H. Top loading insert slot, freestanding. Frame Size: 5½"High X 7"Wide Color: acrylic, chrome. Counter top card frame with adjustable stand from 17.5"H to 29.5"H. Top loading insert slot, freestanding. Frame Size: 5½"High X 7"Wide Color: acrylic, chrome. Counter top card frame with adjustable stand from 20.5"H to 35.5"H. Top loading insert slot, freestanding. Frame Size: 5½"High X 7"Wide Color: acrylic, chrome. Counter top card frame with adjustable stand from 23.5"H to 41.5"H. Top loading insert slot, freestanding. Frame Size: 5½"High X 7"Wide Color: acrylic, chrome. Counter top card frame with adjustable stand from 16"H to 25"H. Top loading insert slot, freestanding. Frame Size: 11"Wide X 7"High. Color: acrylic, chrome. Counter top card frame with adjustable stand from 19"H to 31"H. Top loading insert slot, freestanding. Frame Size: 11"Wide X 7"High. Color: acrylic, chrome. Counter top card frame with adjustable stand from 22"H to 37"H. Top loading insert slot, freestanding. Frame Size: 11"Wide X 7"High. Color: acrylic, chrome. Counter top card frame with adjustable stand from 25"H to 43"H. Top loading insert slot, freestanding. Frame Size: 11"Wide X 7"High. Color: acrylic, chrome. Counter top card frame with adjustable stand from 17.5"H to 26.5"H. Top loading insert slot, freestanding. Frame Size: 11"Wide X 8.5"High. Color: acrylic, chrome. Counter top card frame with adjustable stand from 20.5"H to 32.5"H. Top loading insert slot, freestanding. Frame Size: 11"Wide X 8.5"High. Color: acrylic, chrome. Counter top card frame with adjustable stand from 23.5"H to 38.5"H. Top loading insert slot, freestanding. Frame Size: 11"Wide X 8.5"High. Color: acrylic, chrome. Counter top card frame with adjustable stand from 26.5"H to 44.5"H. Top loading insert slot, freestanding. Frame Size: 11"Wide X 8.5"High. Color: acrylic, chrome. Shelf sign holder with magnetic base. Top or side loading insert slot accepts paper sign, freestanding. Size: 5 ½ High X 7" Wide. Color: acrylic/chrome. Shelf sign holder with magnetic base. Top or side loading insert slot accepts paper sign, freestanding. Size: 7"High X 11" Wide. Color: acrylic/chrome. Shelf sign holder with magnetic base. Top loading insert slot accepts paper sign, freestanding. Size: 7"High X 11" Wide. Color: chrome. Sign holder with decorative legs, sign not included. Top loading insert slot, freestanding. Frame Size: 5 ½High X 7"Wide. Color: copper. Sign holder with decorative legs, sign not included. Top loading insert slot, freestanding. Frame Size: 5 ½High X 7"Wide. Color: creamy pearl. Sign holder with decorative legs, sign not included. Top loading insert slot, freestanding. Frame Size: 7High X 11"Wide. Color: copper. Sign holder with decorative legs. Top loading insert slot, freestanding. Frame Size: 8½High X 11"Wide. Color: copper. Great way to display signs in high traffic areas. Sign stand allows to display single or double posters. Color: copper. Great way to display signs, restaurant menus, artworks. Sturdy floor design. Color: bronze. Floor standing banner stand adjusts in height. Colors: chrome; black, white. Counter standing banner stand adjusts in height. Colors: chrome; black. Gridwall/Slatgrid sign holder is 7" High X 11" Wide. Ideal for displaying prices, promotions. Colors: black, white, chrome. Gridwall/Slatgrid sign holder is 7" High X 22" Wide. Ideal for displaying prices, promotions. Colors: black, white, chrome. Mount sign frame to any wall in high traffic areas. Top loading insert slot. Color: chrome. Bright eye-catching LED display box lights up from inside your advertisement, promotion images. 9.5" x 7.5" x 1"D. Color: clear acrylic. LED display box brights up from inside your advertisement, promotion images, pictures. 12.5" x 10.5" x 1"D. Color: clear acrylic. LED display box brights up from inside your advertisement, promotion images, menu. 28" x 21" x 1.5"D. Color: clear acrylic. LED display box brights up from inside your advertisement, promotion images, menus. 40" x 28" x 1.5"D. Color: clear acrylic. LED display box brights up from inside your advertisement, promotion images, signs. 16" x 20" x 1"D. Frame Colors: silver; black. LED display box brights up from inside your advertisement, promotion images, signs. 18" x 24" x 1"D. Frame Colors: silver; black.